We've been big fans of Mr Raynsford and his work since he started the 365 lasercut projects in 365 days challenge. One of the projects featured there was the marble machine. So we worked with him to bring you the long awaited Marble Machine! Being Solarbotics, we added our own twist to it - a solar cell with a smart circuit. 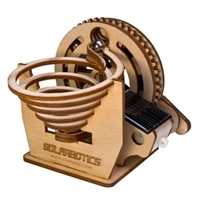 The circuit takes the light from the solar cell, stores it and releases it in a pulse, making the gear wheel move, which eventually drops the marble down the spiral.